Born, raised and educated in San Diego, Cristina Nuno is a true San Diego native in every sense. She has been a member of the community her entire life and has sought out ways to serve and participate in the local culture in all her endeavors. She holds a Bachelor of Arts degree in English with a minor in Ethnic Studies from the University of San Diego—which she completed in only three years! She also served as a leader in M.E.Ch.A. and was a member of the English Honors Society. Cristina attended the University of San Diego School of Law to obtain her J.D. and served as the President of the La Raza Law Student Association and Co-Chair of the Diversity Committee. She also volunteered with the Domestic Violence Clinic and worked as a clerk for several organizations including the Employee Rights Center and the San Diego Superior Court Family Law Facilitator’s Office. 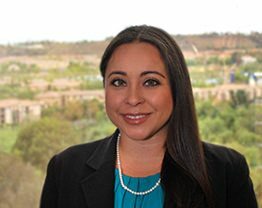 She is a member of the San Diego County Bar Association – Family Law Section, the San Diego Family Law Bar Association and the San Diego La Raza Lawyers Association. Cristina speaks Spanish fluently and in her spare time, she loves roller coasters, her dogs, cooking and watching the Chargers. Goldberg Jones is excited to have Cristina’s legal prowess and her commitment to the community as a part of our firm.